The big mens twill cargo shorts by Cyparissus is your go-to top for work, school, casual fashion, and beyond. It¡¯s the perfect complement for practically any business or work dress code, school uniform, and daily wardrobe. ?These mens work cargo shorts are both comfortable and functional. Double side pockets and drawstring ties at hem, makes these bottoms comfortable for all-day wear yet structured for the perfect fit. Available in a variety of sizes and colors, these cargo shorts comes in a range of plain colors. They are comfortable, let¡¯s your skin breath and helps you stay cool. Get them good and dirty and they wash clean. It is so nice to have something you can wash and still have the feel of comfort. Cotton Material. Mens cargo shorts for men are made of washed cotton-synthetic twill fabric textile, which is more hard-wearing, durability and soft than ordinary cotton. This moisture-wicking and quick-drying material is very lightweight and breathable against to your skin and helps you stay cool in summer. STYLISH DESIGN. 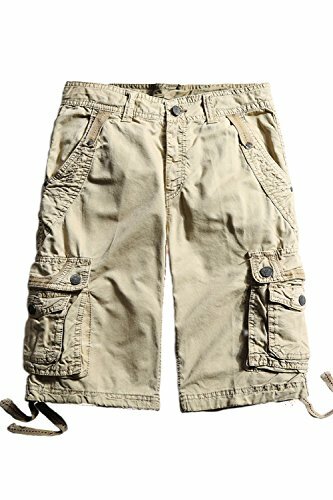 These multi-pocket men cargo shorts featuring lots of stylish and functional pockets with metal snaps, which with lots of pockets are more deep and utility with accordion folds for increased capacity closed with a flap secured and pockets with metal buttons. And you can keep everything in them and will never worry about losing your personal belongings such as keys, wallet, cell phone or note pad fall out of your pockets. CONSISTENT FIT. mens big and tall cargo shorts are tailored to look great, plain colors, neutral tones, no matter where you wear them, with just the right fit you require, ready to handle light work and everyday use with ease. It is your go-to top for work, school, casual fashion, and beyond. It¡¯s the perfect complement for practically any business or work dress code, school uniform, and daily wardrobe. If you have any questions about this product by Cyparissus, contact us by completing and submitting the form below. If you are looking for a specif part number, please include it with your message.